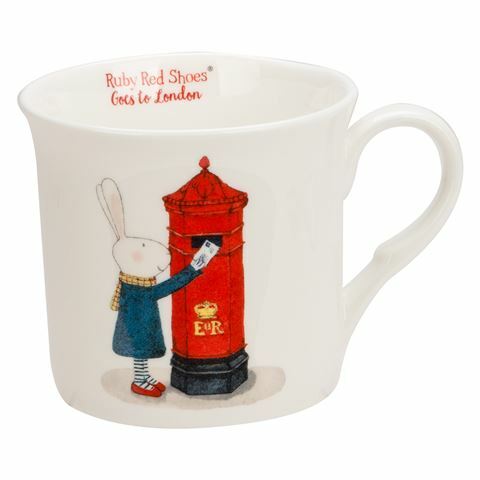 Made in collaboration with famed illustrator Kate Knapp, the Ashdene Ruby Red Shoes London Post Box Mug is the perfect purchase for fans of the very aware hare! Featuring loving illustrations of Ruby Red Shoes’ trip to London, this fine bone china mug is simply bursting with personality. Whether you’re a huge fan of Ruby Red Shoes yourself or know someone who can’t get enough of her, this mug is definitely worth picking up. Art based on the popular children’s character Ruby Red Shoes. Illustrations by famed artist Kate Knapp. Presented in an Ashdene Ruby Red Shoes gift box.